Those first 45 minutes at Brighton and Hove Albion back in August constituted the moment things truly started to fall apart under Jose Mourinho. Five months later and the complexion is remarkably different: with Brighton coming to Old Trafford on Saturday, Ole Gunnar Solskjaer has a chance to win his seventh game in a row as Manchester United caretaker manager. He will not want to make many changes from the team which won superbly at Wembley against Tottenham Hotspur on Sunday. There are, however, certain players who would benefit from getting a start. 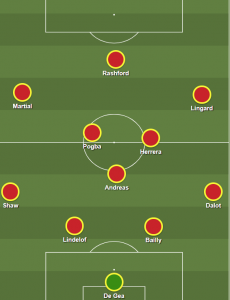 With that in mind, here is how Solskjaer could line up against Brighton on Saturday. Andreas Pereira showed promise at the base of midfield against Reading and it makes sense for him to play over Nemanja Matic on Saturday. The Brazilian needs more opportunities to feature in this team and, eventually, become a viable alternative to Matic, who would not benefit from playing every game. Diogo Dalot, who came on towards the end against Spurs, also needs further chances to acclimatise to life in the Premier League having already shown signs of real promise. And then, of course, comes the madman that is Eric Bailly, back from his three-game suspension and ready to replace Phil Jones alongside the in-form Victor Lindelof.